Did you know the famous Euston Arch was in the way of the Underground? That new escalators and a ticket hall (to replace the old building and lifts on Melton Street and elsewhere belonging to the Northern Line) were needed? It turns out the demolition of the arch was necessary – and at an early stage in the total rebuilding of Euston station – to make way for the new Euston underground station. This post originated by way of comments on another blog which criticised my post on the Victoria Line (as well as lobbying a slight at my style of writing – sadly the person in question had no clue English isn’t a natural language for me…) Their comments revolved around my claim the famous Euston Arch had been demolished for a tube station and it was implied that no-one should trust a blog making these claims. Thank you for those insightful thoughts! Okay, in response to that criticism I did an update to that post to illustrate how this was a fact and not a myth, illustrated with pictures and historical links. Since then more stuff has been found which shows the Euston Arch was indeed demolished to make way for the new Euston tube station. Thus it was deemed a completely new post on this subject was in order. Before we progress on this let me tell you what I have written here is simply reportage on some largely forgotten circumstances surrounding the demolition of the Euston Arch. I happen to be disappointed they did not preserve either the arch or the Great Hall, but there you are, the authorities badly wanted these historic structures gone. Architect’s demonstration in Drummond Street, 15th October 1961 against demolition of the Euston arch. Its generally known the famous arch was demolished to make way for the new Euston station. However the arch itself was demolished well before the wholesale destruction of the main line station began, and the simple reason for that was because they needed to start building the new tube station at Euston first. They couldn’t leave the arch, build the new Euston main line station and then demolish the arch (or move it afterwards to a new location) and thence the new tube station afterwards. The new tube station had to be built first and the Euston arch stood on the very spot the planners wanted the new tube station. Therefore there was no going back on this. The arch had to go despite protestations and despite the efforts of leading campaigners such as John Betjeman to save it. Hole in the ground where the famous arch once stood. The gatehouses on the side of the arch are still extant. As I have already pointed out incredulity was expressed elsewhere that I had implied the Euston arch was demolished to make way for the new tube station. However as I had learnt this fact from my research it couldn’t be unreliable could it? The first thing I did was to post the picture shown above which came from my other post on Euston station. I found these on You Tube and they are related to the construction of the Victoria Line and are considerably later (1963 or 1964) but even these make it clear the arch was demolished for the new tube station. 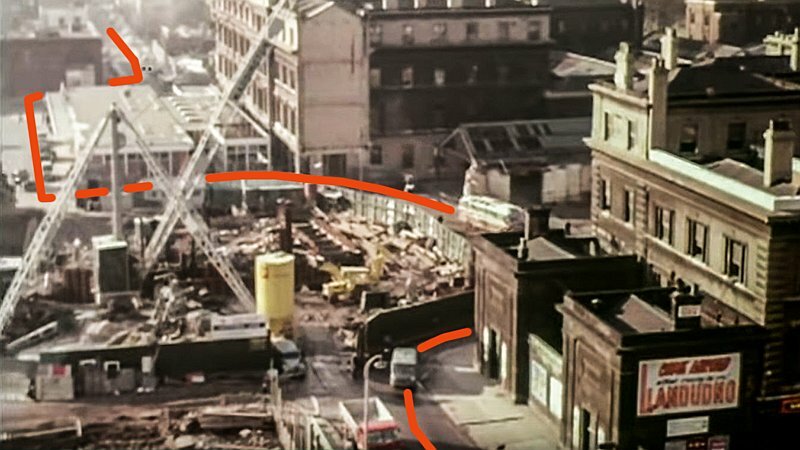 Its clear from this mid sixties view the arch was one of the first structures to be demolished – along with the Euston Hotel. Its always been known the arch was one of the first causalities in the whole process of rebuilding Euston. The actual reasons for this early demise has been barely discussed, and its why I was quite surprised when this was discovered. Being criticised about it also prompted me to find more about the situation in hand…. 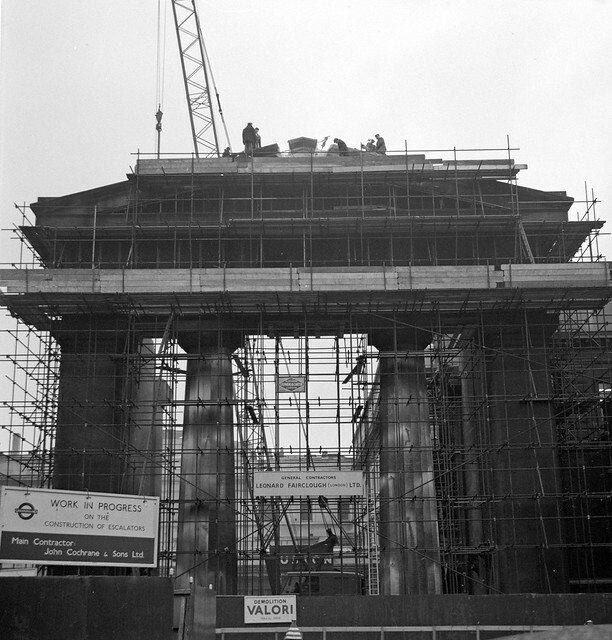 As is so clearly recorded, work to begin demolition of the arch began on 6th November 1961. This very early start was so they could dig a hole in the ground for the new tube station – well in advance of the wholesale demolition of the main line terminus. The Government of the day had already been asked quite a few times to reconsider the arch’s demolition, and it said it would support rescue attempts if the funds could be found. There was in fact a fundraiser underway to enable the arch to be taken down piece by piece and moved elsewhere. It didn’t raise enough money apparently. The Government eventually stood its ground and the protests continued. On 12 July 1961, in a written answer to a Parliamentary question, the Minister of Transport, Ernest Marples, confirmed that he had approved the reconstruction of Euston station which, in his view, was urgent due not only to the electrification programme but because three 50-year old lifts to the Underground station needed replacing, at a cost of £700,000. Moving the Arch was estimated to cost £190,000, compared with only £12,000 to knock it down. Although the Minister expressed his regret at the loss of a major monument of the early railway age, he could not justify the additional expenditure, and saw no practical alternatives to demolition. Source: Politiques de la culture. This is important – and its made again later in the summer of 1961 as shown below. The Government’s transport minister Ernest Marples was one of its strong pro-roads minsters so perhaps there too was a sense of symbolism… anyway these ministers made it clear oft times the arch was in the way of the new tube station! The Government’s view was it cheaper to knock the arch down rather than have it moved elsewhere. 1st August 1961. Government says no to rescue of the arch and points out the arch’s demolition is necessary for construction of the new tube station. Its clear the Euston Arch had to go because its presence was potentially causing delays to any work necessary for the building of the new tube station. 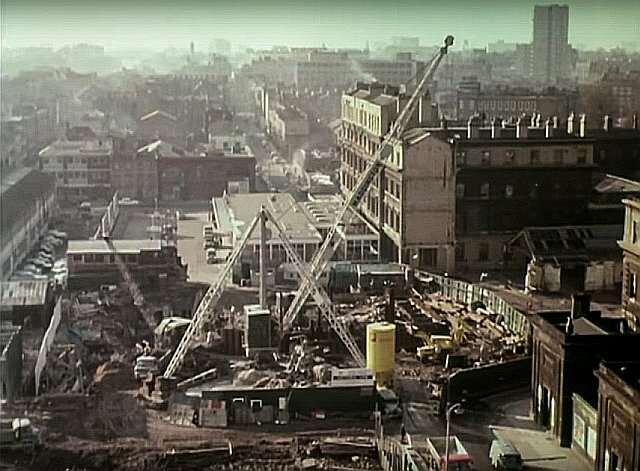 When demolition of the arch began on 6th November 1961 it was once again stressed this had to be done if the underground station was to be rebuilt. Here’s another view, zoomed in to show the direction local traffic took past the hole by way of the former arch’s site. One can see a coach at the spot where the arch stood. Pics from You Tube. Another problem was the traffic through here had to be diverted round the hole in question and the arch was in the way of that too. The above picture illustrates how the traffic diversion was achieved. The new tube station’s hall was designed to be a large affair somewhat like those at Piccadilly Circus and Bank. When the Victoria Line was approved in August 1962, some modifications including extra passages and additional escalators were necessary (as well as diverting the Northern Line) however I think the overall size of the ticket hall remained the same. In fact it was not until about late 1963 that the departures area had been levelled and the Great Hall’s demise was about to begin. Just a couple of days after this update to my 50th anniversary (1 December 2018) Victoria Line post, I found some more pictures showing the fenced off area close up revealing what the boards say. This first one, shown below, comes from Flickr, and was taken in January 1962. What do the boards on the fencing surrounding the site say? Picture embedded from Flickr. Early January 1962. Its clear the demolition of the arch is part of the work on the new tube station. The information on the boards belonging to the contractors, John Cochrane and Sons Ltd, make it absolutely clear this working area is for the purposes of building the new Euston tube station. The signs say “Work in progress on the construction of escalators.” The UndergrounD roundel is displayed. The arch itself is still surrounded in scaffolding, and partial demolition work has been done in part at the rear of the structure. They are declaring the site is being prepared in readiness for the new Euston tube station! What is interesting is in the background the main Euston station, including the Great Hall, is still standing! The wholesale demolition of the rest of Euston station, especially its Great Hall, came later. Demolition work at this time had started on the departures platform however most of the station was still intact. By 6th March 1962, just a tiny bit of the arch remains. Work on the new tube station is still underway. The Great Hall still stands. 6th March 1962. the signs still declare it the site for the new tube station. The new Euston tube station is exactly where the arch once stood. These pictures clearly show why the arch had to be demolished first – long before the rest of the main line station. Finally, as an aside note, I’m aware the Euston Arch isn’t really such, its actually a doric propylaeum, and some call it the Euston Doric Arch. I dont want to get into the technicalities of what it should be called, simply Euston Arch is good enough for me.